Back in December 2016 I described how the state’s justice department announced its expanded effort to prosecute unemployment concealment. That effort is showing results. The entire caseload for two DOJ prosecutors — Annie Jay and Devra Ayala — is apparently just for prosecuting claimants for past unemployment concealment. 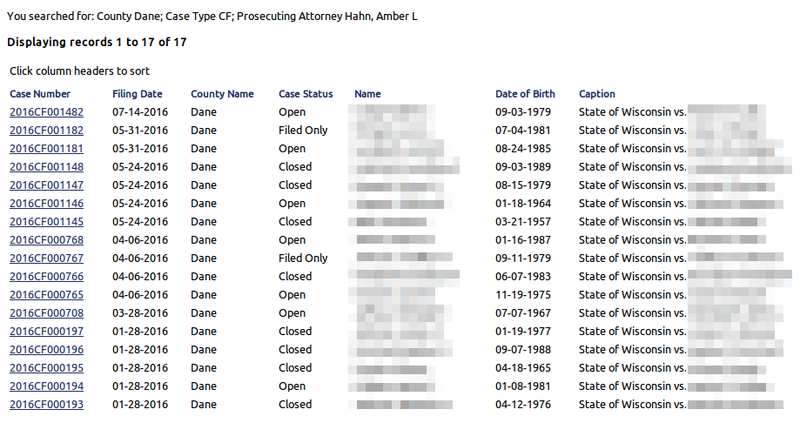 UPDATE (8 Nov. 2016): I have learned that a third prosecutor, Amber Hahn, has another sixteen cases alleging criminal theft for unemployment concealment. That means there are 48 criminal cases for concealment in Dane County. For Ms. Jay, all of her criminal felony cases from 2015 on in Dane County involve unemployment concealment. 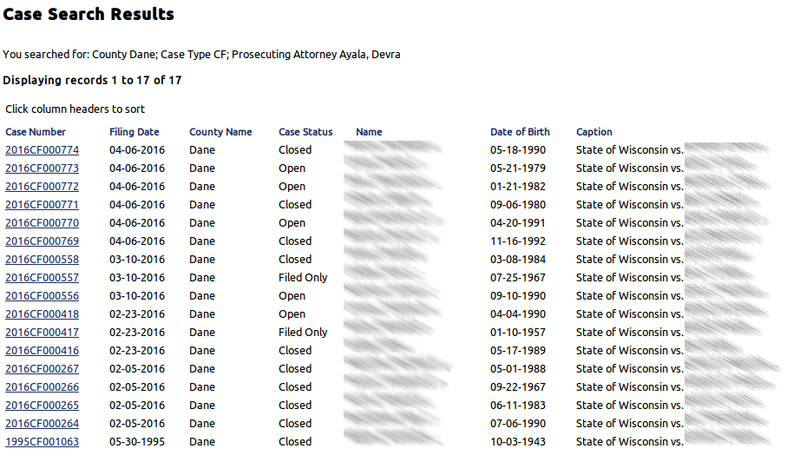 For Ms. Ayala, all of her criminal felony cases in 2016 in Dane County involve unemployment concealment. Combined, there are 32 cases in total (each prosecutor has 16 cases). It appears that all of the defendants in these cases originally lived in Milwaukee. 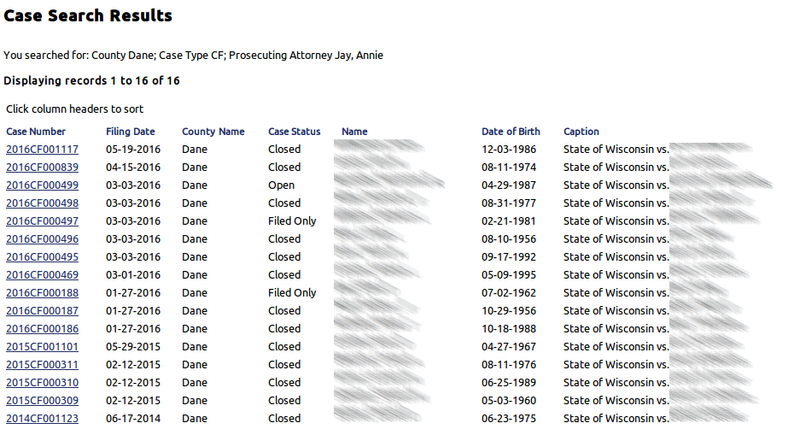 These cases are being filed in Dane County, however, because the alleged “crime” happened in Madison. The claimant’s allegedly false unemployment claims were made on the Department’s computers here in Madison. It appears that the Department of Workforce Development and the Justice Department are prosecuting these cases in order to lay the groundwork for adding new criminal penalties to unemployment claims in 2017. In 2015, there were several bills intended to add new and significant criminal penalties for unemployment concealment that were not passed by the legislature. I expect that these criminal prosecutions by DOJ will serve as “evidence” for why the legislature needs to take up these bills again in 2017 and make felony prosecutions that much easier. After all, if criminal concealment is happening, the reasoning will be, then prosecutors should have all the tools available for going after that concealment. So, if anyone needs another reason NOT to file for unemployment benefits, here is one more: facing felony convictions and jail time for nothing more than a mistake on your unemployment claim. The Department of Workforce Development has issued a new directive about the new definition of unemployment concealment set forth in 2015 Wis. Act 334. As noted already, the new concealment definition makes claimants strictly liable for their mistakes and places the burden of proof on them to explain that any mistakes at issue were not their fault. If they fail to make that case, then the concealment charge and all the associated liabilities will stand. There are two issues to take away from this directive. First, this new directive points out that the new concealment definition is effective for all initial determinations issued after 3 April 2016. So, understand that the Department will be applying this new definition regardless of when the mistakes actually occurred. Mistakes that took place in 2012 will now be subject to this new concealment definition simply because the Department is alleging concealment after April 3rd of 2016. So, the Department stopped following Commission and court precedents on concealment and now has rewritten the statute to reflect what the Department is currently doing. This development represents a government agency pursuing an ideological goal of punishing people who collect unemployment benefits rather than just trying to help people understand and follow claim filing requirements. If these and other legal developments continue, in five or so years employers will be paying UI taxes into a system to which only very few have access. And then many will be asking why have an unemployment system at all. As noted in February of this year, concealment cases jumped to 2.79% of all unemployment benefits paid out. For the three previous years, concealment cases had always been under 2% of all unemployment benefits paid. NOTE: a 0.8% increase is remarkable and unprecedented. If such a change in the unemployment rate or GDP took place from one year to the next, that change would receive headlines across the state. Because 2015 collection data was not available at the time of the February post, I estimated how much concealment money the Department was taking in for 2014 when compared to previous years. That estimate indicated that concealment monies being collected from claimants was rising markedly. Now, in 2016, the Department’s updated fraud report is available. This report, furthermore, has data for both how much concealment is being assessed and how much concealment monies are being collected. In regards to the concealment being assessed, there is good news and bad news. As seen in this chart, over-payments assessed in 2015 declined to 2.21% of unemployment benefits paid out. Still, the concealment charges are over 2% of benefits, so concealment cases remain abnormally high relative to 2011, 2012, and 2013, when the benefits at issue were two to three times greater than the benefits paid out in 2015. The story with the Department’s collection efforts, on the other hand, is pretty much bad news (except for the impact on Department coffers arising from these collection efforts). Here, the concealment over-payments collected in 2011 were under 1% of the benefits paid out that year. In 2012 and 2013, the concealment over-payments collected were under 2% of the benefits paid out. In 2014, however, the concealment over-payments jumped to nearly 3%, and in 2015 concealment over-payment collections climbed to 3.42% of the total benefits paid out that year. In other words, in 2015, out of every $100 claimants received, the Department took back $3.42 in concealment over-payments. These collection numbers also reveal how concealment collection is a growing part of the Department’s collection efforts. Whereas assessments in 2015 show a slight decline in concealment/fraud assessments to non-fraud assessments — 121.10% in 2014 to 112.69% in 2015 — collections for fraudulent over-payments relative to non-fraud over-payments continued to increase in 2015 — going from 116.52% in 2014 to 140.11% in 2015. In other words, nearly two out of every three over-payment dollars collected in 2015 were for concealment. The Department is becoming VERY good at debt collection and, essentially through concealment, discounting the benefits being paid out to claimants. The problem is that claimants who apply for unemployment benefits are not aware of this “discount” on their benefits until charged with concealment six to twelve months after first filing their unemployment claims. These numbers show a sudden increase in 2014 in concealment cases and this increase accelerated in 2015. In this light, the Department’s push to change the definition of concealment is part of an agenda to expand the scope and reach of concealment. The Department countered in its testimony before the committee that an intent to conceal is still required under its proposed changes to the definition of concealment. The proposed language, numerous posts on this blog, a Commission memorandum, and Kevin Magee’s testimony at the public hearing belie the Department’s assertions. Mistakes are increasingly being charged as concealment by the Department, and Commission review applying the actual concealment standard is the only way to fight these kind of charges. Essentially, concealment is becoming the modus operandi of the Department’s efforts in administering the state’s unemployment law. Anyone who makes a mistake is at risk of a concealment charge from the Department, and the Department wants to change unemployment law to reflect this practice. UPDATED 27 Oct. 2018: added ability to click on tables to see full-sized versions. The Advisory Council Bill, AB819, was signed into law by Governor Walker and published on March 31st as 2015 Wis. Act 334. Details of this new law were described in this previous post about the bill. The concealment changes will probably have the biggest impact on unemployment law. As noted previously, these changes mean that the Department will no longer need to show an intent to conceal when alleging concealment against claimants. Claimants will essentially be strictly liable for their mistakes and subject to steep and unforgiving concealment penalties. Given the risk of making a mistake when filing an unemployment claim (especially as the claim filing process becomes increasingly complex), NO ONE SHOULD EVER FILE FOR UNEMPLOYMENT CLAIMS ANY LONGER. Since any mistake can now lead to a charge for concealment, claimants will be at the mercy of Department whims about when to consider a mistake as concealment or not. If a person has no other choice but to file an unemployment claim, the only way to escape a concealment charge is to demonstrate that the mistake occurred because of advice from a Department representative. So, claimants should call up a Department representative and have that person walk him or her through the entire claim-filing process for EVERY weekly certification. Make sure to ask questions about everything that could possibly be an issue in your claim and to document the advice you receive from the representative about those issues. Note that is common for one representative to contradict the advice of a prior representative, so your notes about the advice you receive will be crucial to surviving a concealment charge. Keep in mind that the Department has numerous notices during the claims-filing process about how folks should contact the Department with any questions they might have. So, take the Department up on this offer and actually ask for the kind of detailed advice you need to complete a successful unemployment claim. Insiders in the Department of Workforce Development tell me that in December 2015 the Department began tracking people who file on-line by their IP address. Because IP addresses identity the country from where a person connects to the Internet, the Department can now tell if a claimant is filing from outside the United States. A claimant is not available for work under par. (a) 1. in any week in which he or she is located in a country other than the United States, as defined in s. 108.02 (15) (do) 2., or Canada for more than 48 hours unless the claimant has authorization to work in that other country and there is a reciprocal agreement concerning the payment of unemployment insurance benefits between that other country and the United States. NOTE: Prior to this legal change, a claimant could still be eligible for benefits if his or her job market moved with her to the other country. See Honea v. Bou-Matic LLC, UI Hearing No. 11005590MW (13 June 2012). Act 236 also changed various portions of UI law and operations. One change in the law brought about by Act 236 is to clarify the able and available provision of UI law. If a person is outside of the United States or Canada and is not there for a reason related to current employment they are not considered able and available for work and hence not eligible for UI benefits. This codifies what was existing UI procedure. As such this is not expected to have any effect on benefits paid or the UI Trust Fund. This went into effect on April 22, 2012. Because the Department is now tracking IP addresses, it has begun enforcing this living abroad restriction against claimants. Not surprisingly, besides being declared ineligible for any unemployment benefits for the weeks living outside the US, claimants are also being charged with concealment for intentionally hiding their living aboard status (even though there is nothing from the Department indicating that this issue exists unless you happen to read unemployment statutes). the mere fact that as a matter of law the claimant in this case is necessarily treated as having been “unavailable” for work while staying outside the United States does not obviate the literal truth that he was at all times ready, willing and able to accept fulltime suitable work during weeks 1 through 22 of 2015. The claimant argues that the overpayment should be waived pursuant to federal law that requires state law to include provisions that reasonably affords those entitled to unemployment compensation benefits an opportunity to know, establish, and protect their rights under its unemployment compensation law. As such the department’s failure to include the geographical restriction in the Claimant Handbook or any other notice delivered to the claimant supports a waiver of the overpayment. However, the state law is in compliance with federal law because the unemployment insurance law is accessible publicly. The entirety of the unemployment insurance law simply cannot be reduced to the Claimant Handbook. Moreover, the department has provided its contact information in the Claimant Handbook with instructions to contact the department if there is a question concerning one’s eligibility for benefits. Accordingly, it was the claimant’s responsibility to report to the department that he would be traveling abroad and to ask whether his travel had any impact on his eligibility. In other words, the appeal tribunal held that the Department satisfied its burden to explain unemployment law to claimants because the unemployment statutes can be read by the public and the claimant still had a duty to contact the Department about an issue he did not know was actually an issue and ask whether the problem he knew nothing about was actually a problem. To me, this conclusion means that claimants need to be both attorneys and fortune tellers.